I haven't posted anything for a couple days now. Just wanted to explain that I've been a bit busy in my personal and work life so I simply haven't had time to put up anything new. I usually post something on most days excluding Saturday. I'll continue to resume normal posting when I've got some time to write something. One common idea in personal finance is that it is beneficial to live in an area that has a lower cost of living. Keeping your expenses lower is a basic tenant of financial success. Living in a lower cost area can have a huge impact on your finances. The other side of this however is that wages are generally higher in the high cost areas and lower in the lower cost areas. You could pit this as a choice between lower costs and higher income. Whats better? Do you come out ahead living in a low cost city and earning lower wages or living in an expensive city with higher pay? To examine this issue I decided to do a case study for one profession in a few cities. I am arbitrarily picking both the profession and select cities to look at for my case study. I'm going to look at one profession : Computer programmer. I picked that because its close to my own career field and because I think its a relatively high wage job where pay rates also varies considerably from city to city. If the wages for an occupation do not vary from city to city then its much more of a given that you'd do better in lower cost cities. If your wages are relatively low then again it is much easier to come out ahead in a lower cost city. Basically I chose these cities because San Francisco and Seattle are likely to have more programmers that get paid larger wage and then I chose Minneapolis and Grand Rapids as semi-random examples of lower cost cities to use as alternatives. You might end up with entirely different results if you picked four different cities. First lets look at how wages and cost of living compare for a computer programmer in the four cities. Since housing is the largest expense, I'm going to pull that figure out as well. I got average wage amounts for computer programmers for each city from the BLS Metro wage estimates for May 2010. 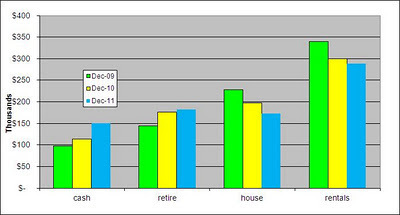 Median home prices are for Q3 of 2011 and I got them from the Realtor.org site from their metro median prices data. (Direct file link). Lastly I got the cost of living (COL) index figures from the Sperlings Best places cost of living site. If we simply stop there then it would be a given that Grand Rapids is the best city because your pay / cost ratios are the best there. But real life is not so easy. The ratio between pay and cost of living doesn't really mean all that much. What really matters is the amount of money you have left over after your expenses. Lets look at an example of how that works : Consider two hypothetical cities A and B. Lets say wages are $100k in A and only $50k in B. Then lets estimate that the cost of living in A is 125% more than city B so that the COL's are A = 225 and B = 100. Wages / COL would be A = $100k/225 = 0.44 and B = 0.5 The wage / cost of living ratio is better in the cheaper and lower cost B city. However what if your basic expenses are only $35,000 in city B and 125% more for $79k in city A. At the end of the day when you take your wages minus total expenses you're left with only $15k in city B and $21k in city A. You come out ahead in the more expensive city even though expenses are 125% more and wages are only 100% more. With this thinking in mind its more important to look at how much money you're actually left with after accounting for wages minus expenses. I'm going to figure an amount for the disposable income after figuring taxes and housing costs. This is an estimate of what a computer programmer would be left with in each city after paying taxes and a home mortgage. I used MortgageCalculator.org to estimate the monthly payment for a $100,000 home at about $820 including principal, interest and property tax. (note that property tax varies widely so this is a simplification on my part) I then multiplied by 12 for a years worth of mortgage payments. This is the total housing cost in each city based on buying a median price home. I am assuming 100% financing which isn't too realistic nowadays but it negates the issue of having to deal with varying size of down payments. I used the tax calculator at Money Chimp to figure the federal income taxes assuming a married couple with 2 kids and only the one income. I also added 9% of wages to the taxes to account for FICA and state taxes. I know that 9% is not very accurate and state taxes probably amount to more on average, but I had to arbitrarily pick a figure so I just went with 9%. If you look at the overall number or the housing umber that is where we see the largest variation. Housing is almost 5 times as expensive in Seattle as it is in Grand Rapids. But once you account for housing the other costs between cities only vary 10-20% more than not. Housing cost alone inflates the overall COL considerably. The cost of living differences with housing excluded are much less from city to city. I'm going to use the Consumer Expenditure Survey to get national average estimates for how much households spend in the basic categories. For example the CES says that the average spent on transportation is $7,677. 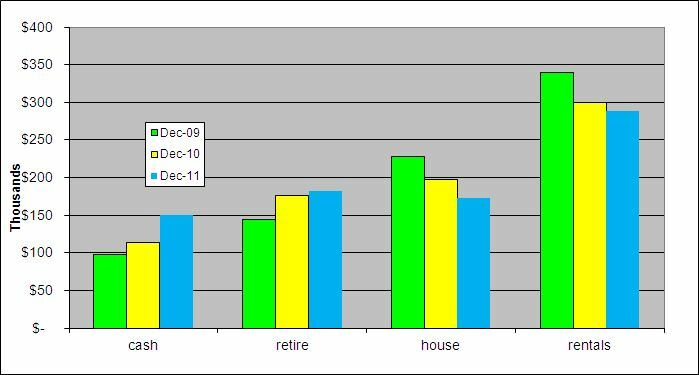 Using the national average as a baseline equal to 100 we can then calculate how much an average household is likely to spend on each category given the different cost of living index. For example if the average for transportation is $7,677 nationally and people in Seattle spend 114 index on transportation then we can estimate that Seattle residents spend 114 / 100 * 7677 = $8,752 on transportation and likewise if the index for transportation is only 96 in Grand Rapids then we can estimate that people there spend 96/100 * 7677 = $7,370. I use this logic to estimate the spending for various categories in each city and then sum up the totals. As expected it does cost more to live in Seattle but not by a wide margin. When you set housing aside the spending in the other major categories does not vary as greatly. Now lets put it all together and see how much you are left with after paying your taxes, paying a mortgage and then spending an average amount on other categories. We can do that by taking the disposable income after taxes and mortgage figured above and then subtracting the sum of other spending in the last table. By this estimation you actually come out ahead in Seattle. Surprised? There are several things that should be noted and kept in mind. This won't happen for any occupation or any city. As I said early on if your wages are much lower then you'll generally do better in the low cost city. I'd much rather try to live on minimum wage in rural Michigan than in Seattle. Where the jobs are matters too. Just because housing is cheap in the Midwest doesn't mean you can find a job there in your field. I'd rather be gainfully employed in high cost San Francisco than be unemployed in Michigan. I used average wages, median home values and average spending for other categories, but individuals are not average. Everyone's spending behavior is different and you should figure out how spending and costs would impact you rather than look at what the average American spends. Remember how I picked a low amount for the FICA and state taxes? You might now point out how that alone could throw everything off. Being off 1-2% on the state tax rate would mean Seattle falls behind. I would point out that Washington state is one of the few states with no state income tax. So, figuring actual tax burden may put Seattle even further ahead. It is more analysis than I care to do today and thats why I simplified it by picking an arbitrary number. It is important to keep in mind that if you were to do a real comparison for yourself then you should really figure the actual tax burden for each city in question based on the state and local tax rates. The answer isn't as simple as finding the lowest cost city or comparing the wage / cost of living ratios. The more important factor is the amount of money left after expenses are taken out of wages. You really have to scrutinize individual occupations in specific cities and there aren't any broad rules that tell us if you'll do better financially in a cheaper city or a higher cost area. You may have heard about grade inflation. Grade Inflation is the trend where grades in school trend higher over time. Today I'll look at some data on that trend. Grades are Up 0.4 in 30 years. This old article at the Dept. of Education from the 1980's looks at Sophomores : High School and Beyond a national longitudinal study for the 1980's Two Years in High School : The Status of 1980 Sophomores in 1982 Table 14 on page 18 gives average G.P.A. figures. For all students the average G.P.A. was 2.6 in 1980. It was 2.5 for men and 2.7 for women. has G.P.A data and reports in figure 8 that average G.P.A is 3.0 for 2009. They also have overall G.P.A. figures going back to 1990. Its possible that higher grades in high school are simply a reflection of smarter kids. If the curriculum didn't change and the average test scores went up due to smarter kids then this would rightly result in higher grade averages. Unfortunately this isn't the case. In Are High School Grades Inflated? 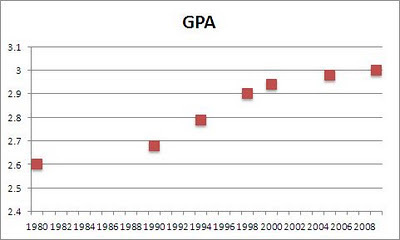 the ACT looked at grades from 1991 to 2003 and compared G.P.A. to ACT scores. The ACT scores act as a control for the individual students knowledge and aptitude. If kids were just getting smarter then ACT scores would go up and someone who got a 25 on the ACT 20 years ago would get the same GPA then as now. The ACT study found that G.P.A. went up for students when you hold ACT scores constant. In other words a student that got a 14 on the ACT in 1991 would have averaged 2.40 G.P.A. but by 2003 the kids with 14 ACT scores were getting 2.65 G.P.A. The kids remained the same smartness (as measured by the ACT) but grade averages went up across the board. The article High School Grade Inflation from 1991 to 2003 also from the ACT goes into further depth on the topic. You might theorize that G.P.A's are up across the board because the course material in school has gotten easier. This too is not the case. Curriculum at high schools has gotten more difficult on average. The ED report AMERICA’S High School Graduates results of the 2009 naep high school transcript study has data on curriculum as well. Across the board students are taking more credits and higher level courses. In Figure 6 we see that in 1990 students took 23.6 credits on average but by 2009 they were completing an average of 27.2 credits. Students took tougher courses too. For example Table 8 in the report shows that in 1990 only 57% of students took advanced math but by 2009 there were 84% completing such courses. Likewise the percent of students taking advanced science went from 61% in 1990 to 86% in 2009. A while ago I wrote about Unemployment Figures by Occupation but that data was for broader occupational groups. The Wall Street Journal has a page with a search function so that you can find the unemployment rate per specific occupation. The data they used is from the BLS and tracks 500 individual occupations. The data on the WSJ page is from 2010 so its not very current. Still it could be interesting or even useful for you to know what unemployment looked like in a specific occupation. I've looked all over the BLS site and for the life of me I can't find where the unemployment rates for specific occupations might be find. It has to be there, but I just can't find it. There is a LOT of data on the BLS site and its easy to get lost over there. but I just pulled out the total number for the entire population. I picked the data for people over 25 years old. So there are various folks under the age of 25 who are not included. If you want the information including people 18 to 24 years old then that is also available. I figured that looking at people age 25 years and older would be a little more meaningful. There are a lot of folks 18-24 who are still settling into their occupations or working a transitional job after college, etc. As you can see there is also a large % of the population that makes no income. These would be people who do not work for various reasons. 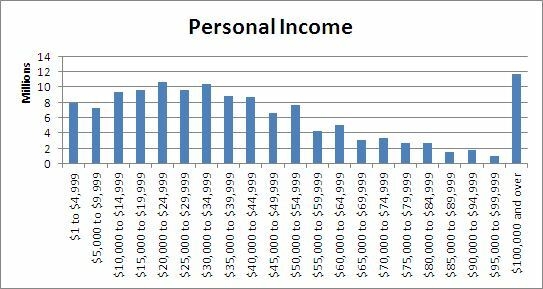 This is what I think is the real meat: Among the population over age 25 with earnings, about 1/3 of people make under $25,000, another 1/3 make between $25,000 and $50,000 and the other 1/3 make over $50,000. DQYDJ writes about Another Salary by Major Chart! (For 2011 Graduates) and here is a direct link to the report in question which has info on starting salaries for specific fields. MyMoneyBlog answers the question Do I Have An Obsession With Early Retirement? This does NOT include state tax filing. Looks like state filing is an extra $39.95 which is not a particularly good deal. If your like most of us and you have to pay state income taxes then you might want to shop around. If your state does not have state income taxes then you can get free federal filing. The offer is only good January 19-20th. On FreeMoneyFinance a little while ago a reader shared the story of their finances They were currently working on paying down their credit card debts. Paying off your credit cards is of course a very good idea. However they were not saving anything for retirement in order to have more money to throw at the debt. The thought occurred to me that they may be foregoing a 401k employer match in order to pay off credit cards. That employer match is worth 100% of your money while paying off a credit card only saves you the 15-30% interest the credit card charges. It doesn't make sense to give up getting 100% free money to save 15-30% interest for your dollar. Better yet if you save money in your 401k then you can take a loan against that 401k money and use the loan to pay off your credit cards. Yet another bonus of saving money in retirement is the Savers Credit that you may be eligible for. There is a tax credit for lower income earners such that you can get 10-50% tax credit on your first $2000 of retirement savings. Lets say you are married with $50,000 net income and you have $25,000 in credit card debts. You have an extra $1000 at the start of the year from your IRS return. You could either take that $1000 and pay down your credit card or use to to put towards your 401k savings. Your employer matches your savings 100% up to the first 5%. You take your $1000 after tax dollars and put it towards your credit card debts. This will save you 20% interest for the year. At the same time you put $0 into your 401k. Net result = You save $200 in interest. Net benefit $200. You contribute $1,333 to your 401k. This will cut your tax bill by $333 due to the pre-tax nature of the money. Your employer matches the $1,333 due to the 100% employer match. You're in the 25% bracket so if you put $1,333 into a 401k in pre-tax dollars then thats equivalent to $1,000 in post tax money. You now have $2,666 in the 401k between your $1,333 and the employer match. The federal government will match your $1,333 due to the savers credit. You get a $133 tax credit. Take the $133 and pay down your credit card. This leaves you with $867 on the credit card. Take a $867 loan against the 401k and use that to pay off your credit card. At the end of the year you'll have $2666 pre-tax balance in your 401k and a $867 loan against the 401k. Lets say you had to cash out the 401k money to repay the 401k loan. This would force you to pay 25% taxes and a 10% penalty. You would need to cash out $1333 form the 401k to pay off that $867. So we're now left with $1333 in the 401k account and the 401k loan paid off. 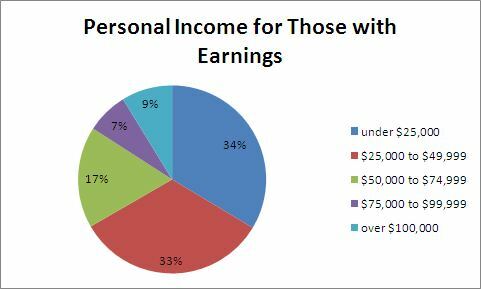 If you were desperate and had to cash out the entire 401k then you'd be left with $867 after the 25% taxes and the 10% penalty. Net benefit $867. In the end you'd be looking at Option A = $200 or Option B = $867. Your 401k loan could have fees associated with it that might make such borrowing a bad idea especially for smaller loan sums. Some employers only match 25% or 50% of your 401k contributions. In those cases paying down credit cards first might make better sense. If at all possible you should certainly try to get a lower interest rate on your credit cards. Paying 0% interest on a promotional credit card deal can help a lot. The Savers Credit has specific rules and a income cap on it so only lower income households qualify. If you own any rental property then it is a good idea to keep an eye on the rental market in your area. One of the important indicators for rentals is the vacancy rate. A high vacancy rate can be a problem for landlords since that will generally mean there are more open rental units than prospective renters. If this persists then it can result in lowered rents as landlords compete for tenants. On the other hand a very low rental vacancy rate can be good for owners since it points to more demand than supply. The U.S. Census Bureau tracks quarterly vacancy and home ownership rates. They have data going back to 2005 for each quarter. As you can see there is a pretty wide range in the vacancy rates. The median for the cities given is 8.7%. The high in the list is 17.1% in the Houston area and the low is 2.6% in Springfield, Mass. This is current as of the third quarter of 2011. The vacancy rate for a metro area will go up and down from quarter to quarter. Lets take a look at a single city over time. 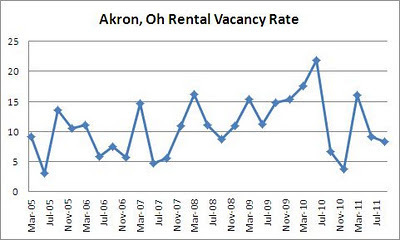 Below is the quarterly vacancy rate for Akron, Ohio going back to 2005. The vacancy rate in Akron swings up and down a few percent points most quarters. It seems like there is something of an annual seasonal cycle with a peak in vacancy rates in the first quarter of the year. Sick Leave : Who gets it, how much do we get, how much do we use it and why? The BLS has good data on sick leave benefits for workers.Its one of the benefit categories they track. Most people do get paid sick leave. 61% of all private workers get paid sick leave. It varies a lot across occupation, pay rates, employer size etc. Here is how the % of people with sick leave varies across different characteristics. The same BLS report also tells us how much sick leave people get on average. The private average worker gets 8 days of paid sick leave after 1 year service. The amount of sick leave varies however depending on the job and employer. How Much Sick Leave do People actually use? I found a couple sources to answer the question of how much sick leave people typically use. "Among those firms that did track it, the average number of sick days used per year by a salaried exempt employee was 3.8 days; salaried nonexempt employees used 5.6 days; nonunion hourly employees used 4.8 days; and union hourly employees used 5.5 days." Also CCH Incorporated studies absenteeism and their 2007 data found a 2.3% absenteeism rate for that year. If people are absent 2.3% of the time then that is around 6 days in a full time work year. The numbers vary but it should be safe to say that workers typically use 4-6 days of sick leave per year. Why do People Use Sick days? CCH also has data on why people were not at work. Personal illness is pretty straight forward. That means the person missed work because they were sick. Family issues could cover a number of things. I assume a lot of it is childcare related. Parents often have to care for their sick children. An article from the National Partnership for Women and Families says "On average, school-age children miss at least 3 school days per year due to health reasons." So if you have a kid or two then its likely you'll need to miss some work to take care of your child. Personal needs is pretty vague. I don't know if that means "I need to go to the football game" or if its more along the lines of non illness things like court appearances, religious reasons, or what have you. I like that they have a category for "entitlement mentality". Thats the people calling in sick for no other reason than because they have unused paid sick days to use. Its pretty bad that stress causes 13% of the stick days. Whats that say about our work environment in this country? What is the Unemployment Rate in Your City? Just recently the national unemployment rate dropped down to 8.5%. However the national employment rate is just the nation wide average. Unemployment may be far higher or lower in your city. The unemployment rate is as low as 2.8% in parts of North Dakota and as high as 27% in El Centro California. The BLS published the unemployment rates for major metropolitian areas as of Nov. 2011. Note that the data is not seasonally adjusted. Here is a sample of the unemployment rates for various metropolitan areas across the USA. The full list on the BLS site has a total of 371 metropolitan areas so you can visit the BLS link to see the full list. FMF also has A Great Example of How to Make Big Money with Credit Cards Where one of his readers reports making over $3800 in a single year on rewards credit card promotions. For the 2011 year we're up about $20,000 total in our net worth. It would be up considerably more but our real estate continued to lose a lot of value. We own rental properties as well as our home so a lot of our assets are in real estate. As you can see our cash assets went up a fair amount over 2011. I normally wouldn't want to have that much of our money sitting in cash but we've been home shopping so we've had a large amount of cash set aside for a down payment. In addition our debt levels went down about $16,000 due to paying down our mortgages through the year. There is some interesting stuff in the paper Unfulfilled Expectations: Recent College Graduates Struggle in a Troubled Economy published by researchers at Rutgers. The study found that the median pay for people who had internships in college ended up making higher beginning salaries once they graduated. That is about 24% higher pay for the recent graduates with internship experience. I would not conclude that this is a simple direct cause and effect relationship. In other words simply having an internship won't guarantee you higher pay. I also doubt that employers are willing to fork over 25% more pay on average just because your resume has an internship listed. I assume that the higher pay is a combination of things. People with internships are going to have more experience in the field and are therefore more likely to get jobs related to their field. If you have no experience it will be harder to get a job and more people without such experience may end up having a hard time finding a job related to their major and settling for any job they can find. Furthermore the people more likely to pursue internships are also more likely to be more aggressive in their job searches. However I'm sure that an internship will help you with some real world experience that will be valuable in your job hunt. I also assume that employers look on it favorably and are more willing to extend jobs and even higher wages to people with internships versus those without internships. Its a very good idea to get internship experience in college. People in a specific occupation will make different wages in different cities. You can find wide variations in pay from state to state or city to city. You might safely assume that pay for nurses is likely to be higher on average in San Francisco or New York City high cost of living cities generally end up with higher pay rates. But even that isn't a guarantee and its possible some jobs get paid more in Wyoming or Louisiana than N.Y.C. If you are job hunting or thinking of relocating then it can be particularly useful to know typical wages for a specific occupation in different cities. Granted this is a little over a year old now but its close enough and wages won't have changed hugely since then. The list on the BLS site is organized by state. First you can find your state and city then click on its link. If the city in question isn't listed then you can try the closest city. If you are going to be in a small town or rural area then you can look at the "nonmetropolitan" area that is closest. This will take you to a page with a list of major occupation categories. From there you can pick your general field and it will give you a list of occupations and the average wages in the city in question. So say you are a nurse and you're thinking about moving to Las Vegas, Nevada. You would want to know how much nurses typically make in Vegas versus your current home of Sacramento California. You can just look up both cities in the list on the BLS site and then find the mean wages there. Mean pay in Vegas is $75,040 and Sacramento is $93,420. Over on FreeMoneyFinance there was a discussion in the comments a long while ago about certain insurance investments. One person there linked to this video on Youtube. I found the video interesting in itself. 1. They cite a $840 annual premium for $1M level term. I get quotes of around $700 annual for $1M. 2. The video assumes a 30% tax rate. 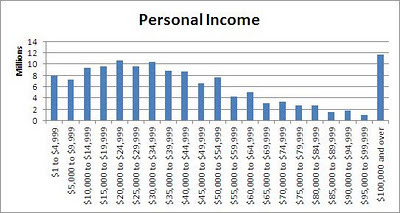 Marginal tax bracket of 33% kicks in around $200k taxable income. Which is the top 1-2% of the nation. 3. They assume a 2% management fee on your investments that you might make instead of the cash value insurance. Thats high I sure hope people aren't paying that. Index funds are more like .1%-.5% and mutual funds 1.5%. 4. They base the performance of the cash value policy off of assumed dividend rates that are not guaranteed. A mutual insurance company pays dividends but these are not guaranteed. Its a fairly safe bet you'll get a dividend but the specific amounts will vary and depend on the financial performance of the mutual insurance company. They are stacking the deck in favor of the cash value insurance. The rate of return on the cash value insurance is about 4.6% initially. Then they add the impact of avoiding the 30% taxes, 2% management fee and not buying the over priced term policy and it the effective return they claim for the whole life goes up to 9.8%. Why would someone be paying 30% on a mutual fund anyway? Are they going to do nothing to avoid taxes and shouldn't it be taxed at the 15% long term capital gains rate? Or better yet you should put your savings first into a tax sheltered retirement account and possibly avoid taxes all together. Who's going to pay a whopping 2% expense fund on a mutual fund? You shouldn't be buying funds with such high expenses since that alone will erode your returns significantly. Don't over pay on term policy. Why wouldn't you shop around for your term policy? Today a 20 year AAA municipal bond rate is around 3.4%. Those are tax free and can be bought with marginal initial fee and no ongoing expenses. However a couple years ago muni's were going for 5.5% and yields on safe bonds are sure to climb in future years when interest rates go back up. We can't stay at rock bottom interest rates forever. Now that 4.6% internal rate of return on the whole life policy is not bad at all in my opinion. I don't know if that would be the current rate of return from the policy since the example is a bit old. In any case this is actually a fairly decent whole life policy from that return rate. Of course the details of what kind of return you'll get on insurance policy depends on the policy, your situation and the often performance of the insurance company if its a mutual paying dividends like in the example. If you are looking at whole life insurance make sure you are getting a clear picture of the financial performance of the investment component. Don't expect whole life insurance to give you 9% returns and if someone claims it will then be very suspicious. I just did a google search to find auto repair shops in my home town. I was pleasantly surprised when the google results had two shops which both had pretty good reviews with >4 out of 5 stars average. But then I read some of the reviews and they just seemed ... suspicious. Almost all of the reviews were 5 star reviews, they had a first name but no last name given and the comments were very positive but usually pretty generic in nature. I clicked on a couple of the reviewers and noticed that two of the reviewers both reviewed mostly the same set of companies. Then I noticed that most of the reviewers had submitted reviews for various businesses in multiple states shortly after one another. If you believe the reviews then one reviewer went to a Moms fitness club in California, had a car towed on Colorado, hired a plumber in Toledo Ohio and then got their office AC fixed in Australia and finally got some keys replaced in New York, NY all within a 7 day period. I think not. Unfortunately there are folks out there that pay for fake reviews. This article at Trak.in captured an image of an ad hiring people to write reviews. I think that most of the reviews on the internet are legitimate but you do have to be on guard for some fakes. 1. Lots of 100% positive reviews. Of course a good product or service can have good reviews but its also a potential sign of fake reviews. Pay attention to the distribution of ratings that the reviewers give. If >90% of the reviewers give 100% rating then that may be a little too high. 2. Generic language. A normal review will likely touch on some specifics and note some details. Fake reviews are more likely to be widely generic in nature. The reviewers are not real customers so they can't talk with first hand experience so they can't be too specific. 3. Overly happy and positive language. Repeat positive adjectives in multiple reviews are a possible sign of fakes. If every reviewer gives five stars and makes sure to point out that the company is honest, thorough and fair then that may be more than coincidence. 4. Perfect English. If nobody ever makes a spelling error, has good grammar and fixes every single typo then that is probably not real. GO read an average webpage with random people making comments and you'll see lots of spelling and grammar errors. 5. Randomly Generic reviewer Names. If all the reviewers have fairly random generic names then that may be suspect. When many people pick a username on the Internet they will choose some sort of nickname or pretend name. Everyone doesn't simply go by their common first name. Reviews from Veronica, Mike, Luanne, Matthew and Terry are a little more suspect than reviews from "J. Armstrong", "RoyRoyRoy", "David Price" and "Colorado123". 6. Multiple reviews within short time period. If almost all the positive reviews are spread over a short period then this could be a sign of fakery. Once you see a few red flags you can do a little more digging. Investigate the individual reviewers a little more. Click on the reviewer names. Fake reviewers are going to give all positive reviews. If they were normal real people then there would be several less than positive or negative reviews. If you see a lot of reviews on widely various products or businesses in far flung places then this is suspect. If the red flags above are consistent in all the reviews then that further puts them in doubt. If the reviewer has 20+ reviews that are all 5 out of 5 stars spread across various states then they are probably not a legitimate reviewer. Check other review sources. Rather than only look at Google results, also check Yelp, Bing, Yahoo, etc. Do a google search for products or services and the word 'review' to find more review sources. 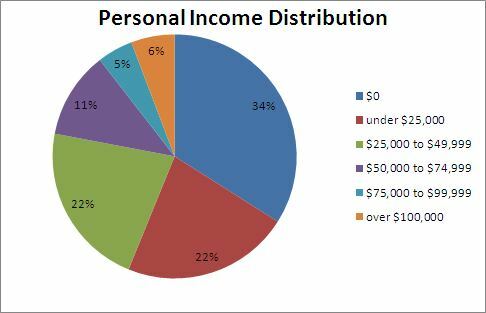 fivecentnickel tells us What are the 2012 Traditional and Roth IRA Contribution Limits? Dollarversity is giving away 3 copies of The Millionaire Next Door. Its a good book that I read and reviewed a while back. Lately the stock market has been on a fairly wild ride of ups and downs. Some people may be thinking that they don't have the stomach for that rollercoaster and choose instead to put their money into gold. However gold prices can be just as volatile as the stock market. 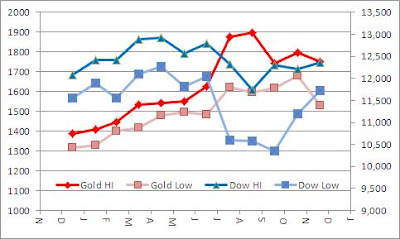 To compare volatility I decided to compare the monthly high and low prices in 2011 for both gold and the Dow. I grabbed historical prices for the Dow Jones for 2011 on a monthly basis. I then go the monthly highs and lows for the spot gold price off the Kitco website. The average difference between high and low per month was 8.5%. In October there was a 19% range between the high and low trading values of the Dow. February had the smallest range between high and low at only 4% difference. The average difference between high and low price for spot gold was 8.7%. March had the smallest difference between high and low at only $47 or 3% difference from $1400 to $1447. September had the highest variation and prices ranged from $1598 to $1895 in that month which is about 19% difference. Comparing these values you can see that the volatility in prices between spot gold and the Dow were actually quite similar in 2011. Lets take one more look at the data. Here is a graph showing the monthly highs and lows of gold and the Dow plotted. Gold price is on the left axis in dollars and the Dow value is on the right axis. Viewing it visually you can also see the similar amount of volatility between gold prices and stock prices over the 2011 year.